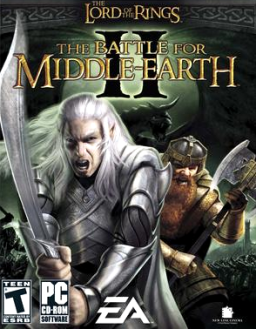 The Lord of the Rings: The Battle for Middle-earth II, abbreviated BFME2, is a real-time strategy video game developed and published by Electronic Arts. It is based on the fantasy novel The Lord of the Rings by J. R. R. Tolkien and its live-action film trilogy adaptation. 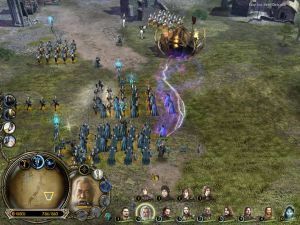 The game is the sequel to Electronic Art's 2004 title The Lord of the Rings: The Battle for Middle-earth. The Windows version of the game was released on March 2, 2006 and the Xbox 360 version was released on July 5, 2006. Along with the standard edition, a Collector's Edition of the game was released, containing bonus material and a documentary about the game's development. Set in the regions of northern Middle-earth, the game focuses on the events of the War in the North. For the sake of gameplay, the game takes several liberties with Tolkien's works and the film trilogy. Some characters were altered in their appearances, abilities, and roles; for instance, a combat role in the game is given to Tom Bombadil, a merry hermit from The Lord of the Rings. In addition, Tolkien's earlier novel The Hobbit lends several elements to the game, including characters such as the Giant Spiders from Mirkwood. The story for BFME2 is divided into Good and Evil Campaigns. Both campaigns focus on the battles fought by the newly introduced factions: the Elves, Dwarves, and Goblins. The player goes through nine fixed missions in either easy, medium, or hard difficulty mode. Narrated cut scenes provide plot exposition between missions.